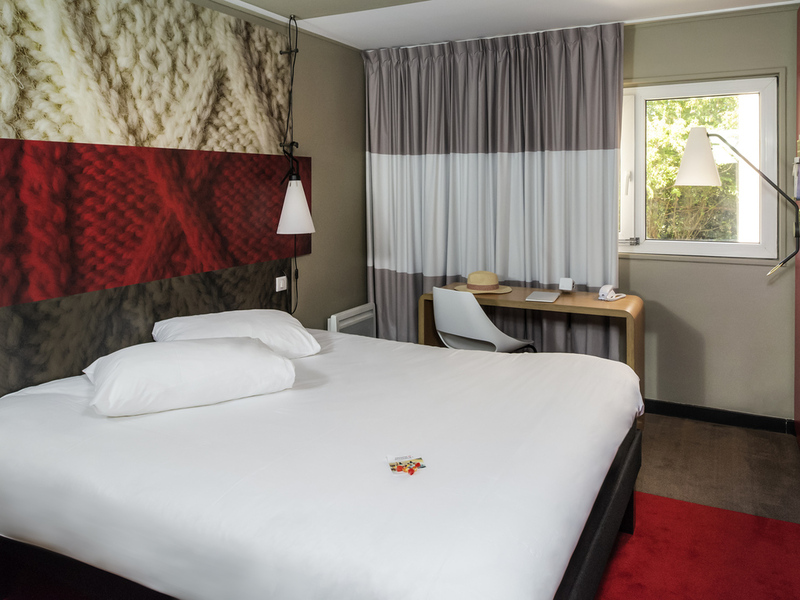 The ibis Caen Porte d'Angleterre hotel is ideally located close to the center of Caen, accessible from the ring road via the Porte d'Angleterre exit and en route to the ferry port and Sword Beach. Perfect for visiting the ducal city with its memorials and other attractions, this 3-star hotel has 82 comfortable rooms including 8 family rooms, free enclosed car park, bar, restaurant, 3 modular meeting rooms and free WIFI to ensure you have a great stay whether you are traveling for business or leisure. Hotel is 10 min from the Mémorial de Caen and the beaches and 20 min from Cabourg. Located close to the ferry, the D-Day landing beaches, the Memorial and downtown Caen. In a peaceful, green setting, accessible from Caen ring road (périphérique) exit 4A or 4B. A mix of rooms, each decorated differently, with bathtub or shower. The Mathilde restaurant is open 7pm-10:30pm unless otherwise indicated at the reception desk. Dine in the restaurant or in your room. Snacks available round the clock.